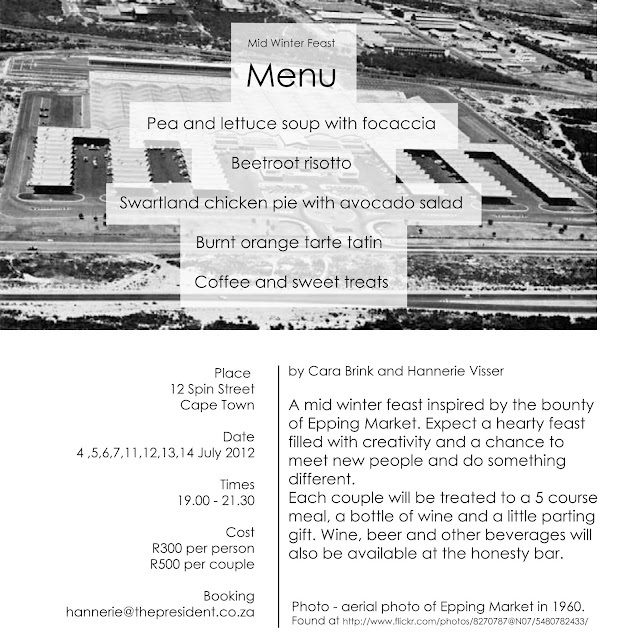 Cara Brink (Freelance Chef) and Hannerie Visser (The President) will be hosting a series of dinners from the 4 July 2012 to 14 July 2012 inspired, and sourced from, the Cape Town Market. Hannerie is a avid supporter of the Cape Town Market and the colorful and fresh array of characters and produce. The Cape Town Market will be supporting this event and calls on all stakeholders and lovers of fresh produce to also support this, it is not often a gourmet feast is prepared in honor of an industry and we are humbled that Hannerie and Cara have chosen us to showcase what can be created from fresh produced sourced straight from the farm.